Bernoulli’s principle states that: Low Velocity = High Pressure and High Veolocity = Low pressure. If you imagine an airplane wing, It is designed for the air on the top of the wing to be faster than that of the bottom of the wing. Since the air is slower on the bottom it creates a high pressure zone which will create lift. 1. 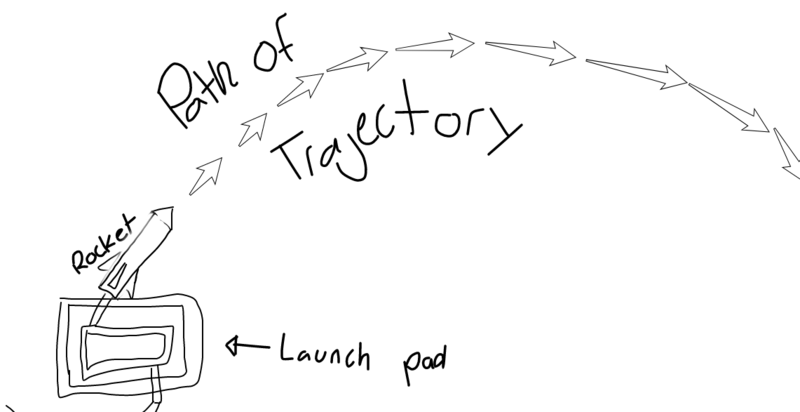 Draw a path of trajectory of your rocket. Lift, Bernoulli’s principle states that: Low Velocity = High Pressure and High Velocity = Low Pressure. The air going over the rocket is travelling at a faster rate than the air under the rocket. The high pressure on the bottom will create lift and keep the rocket up. 5. Did some rockets work better than others? How does the shape of the nose and fin effect the trajectory of the rocket? Explain in terms of the four forces that act on a rocket ship. Yes, some did. I found that if the nose better fits the fuselage, the farther it went. Without proper fins, the rocket just sat in the air and spun on the way down. 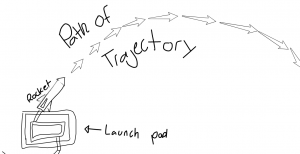 The main goal of making your rocket go far is that you decrease drag while increasing lift. If the nose is flat on top of your rocket it will increase the amount of drag on your rocket making it not go so high. If it is shaped in a way where it cuts through the air, the rocket will be more aerodynamic and fly much farther. Same for the fins, the fins are also supposed to make your rocket more aerodyamic and decrease drag, If they are positioned in a way that makes it cut through the air, the fins will also contribute to less drag. Acceleration: The rate that an object increases in speed. Center of Drag: The center of which drag will act upon an object the most. Center of Mass: The center of which mass of an object will balance. Drag: An accumulative amount of a resistant force on an object. Inertia: An object will be in rest unless acted upon by an outside force. Mass: A unit of measurement relative to an objects property. Momentum: The amount of movement an object has. Pressure: A force that exerts force upon another object. (Gas,Liquid, Solid). Velocity: A measurment of how fast something will move in a certain direction. 1. How did the height you estimated your rocket would reach compare with the actual estimated height? To be honest, I thought it would’ve gone a little bit higher than it did. Shape of the cone, shape and positions of the fins. No, it initally veered off course. I think it was because of the top of my rocket. The top of the rocket was slightly crooked and did not point up straight. The cone was also more slightly loose, but it helped with the deployment of both of my parachutes. preferred to work alone on it? Why? I would preferred everyone did their own rocket. I think it is a more satisfying experience if the rocket was sucessful because it was your work and not between two people. Work would be split between two people which can make it harder to agree on a design and bring two seperate aspects of the rocket together. At first, the size of the fins on my rocket were going to be much bigger than they were. But, if they were the size I intended them to be, they wouldn’t fit very well on the rocket and be much more blocky. I think making the fins smaller and more sleek along the rocket actually helped my rocket. 6. How do you think the rocket would have behaved differently if it were launched in a weightless atmosphere? If it was in a weightless atmosphere, I think the rocket would go farther, but the speed it would go be much more slowed down. 7. What safety measures do you think engineers consider when launching a real rocket? Consider the location of most launch sites as part of your answer. Making sure the area around the lauch pad is clear of debris. Building the launch pad on relatively flat terrain which is clear of any trees and such. Making sure that the rocket is clear for takeoff if there was any air traffic up in the sky. 8. When engineers are designing a rocket which will carry people in addition to cargo, how do you think the rocket will change in terms of structural design, functionality, and features? Rocket design would accommodate living quarters for those on the rocket. To increase ability to communicate with those who are on land. Depending on the length of travel or if they are orbiting around Earth, the rocket would not only need space for food, water, and toiletries, but something would have to send it to those in the rocket. 9. Do you think rocket designs will change a great deal over the next ten years? How? I think designs for rockets will have little change over the next ten years. Maybe a few moderate changes. The design of a rocket could be made to accommodate more people, be slightly more aerodynamic, or become more fuel efficient. 10. What tradeoffs do engineers have to make when considering the space/weight of fuel vs. the weight of cargo? The more fuel there is, the more the rocket will weigh and there would be less space for the cargo. If there is a lot of cargo, the rocket will weigh more and there wouldn’t be sufficient space for fuel in order to get to a set destination especially if it is a good distance away from Earth.